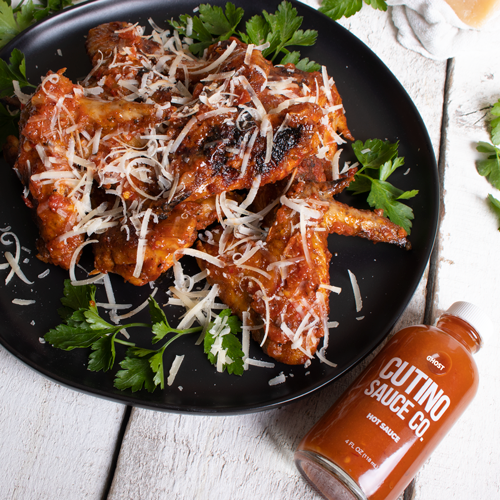 Pizza Wings - Cutino Sauce Co.
1. Soak wings in a mixture of the water, salt, and vinegar for about 30 minutes. 2. Place garlic in an oven safe pot/dish immersed in evoo. 3. Bake garlic at 300F for 35-40 mins, remove from heat and cool. 4. Once garlic is cooled, place in a blender with oregano and a pinch of salt. Pulse to incorporate. 5. Prepare your grill of hard wood charcoal to white hot. 6. Rinse chicken and toss in a Tbsp of evoo and a pinch of salt and pepper. 7. Grill wings until evenly brown and set aside. 8. In a saucepan melt the butter then add both hot sauce and tomato sauce. Simmer until combined, then remove from heat. 9. Toss wings in a bowl with the garlic oil mixture and place back on the grill to brown on each side. This step is done quickly so garlic doesn’t burn. 10. Remove the wings from grill. Using the same bowl, toss in the wing sauce. Place back on grill to caramelize on each side then remove and toss wings in the remaining sauce in the bowl. 11. Top with grated parmesan and enjoy!